The ideal valve oil would be long lasting, cheap, and effective. Can any of them meet these criteria? 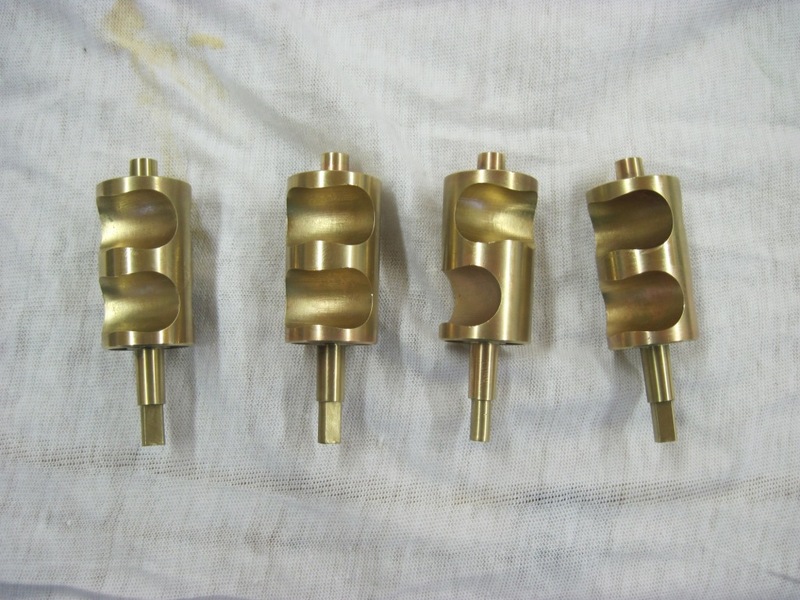 You have to also consider that every brand of horn has different valves; the tolerances between the valve and the valve casings vary from brand to brand and model to model. That means that one oil may work slightly better or worse depending on which horn you’re using it in. The standby valve oil that you’re most likely to encounter is good ol’ Al Cass. 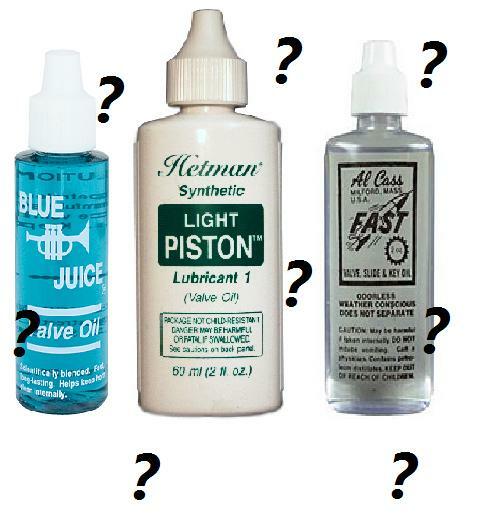 It was the first valve oil I used when I started playing and it’s what all the other kids used too. For those bundyish horns, Al Cass is a great oil. It’s inexpensive and effective on horns with a moderate to large amount of tolerance between the valve casing wall and the valve. It’s good for the youngsters because they tend to dump buckets of oil into the valves and because it’s cheap, there’s no harm in letting that oil flow. After I went through my Al Cass phase, I was looking for something with a bit more performance. The next oil I got into using was Blue Juice. More on the expensive side, Blue Juice gave me smoother action. At this point I was using a Bach Stradivarius and at first I liked this oil…but that changed pretty fast. 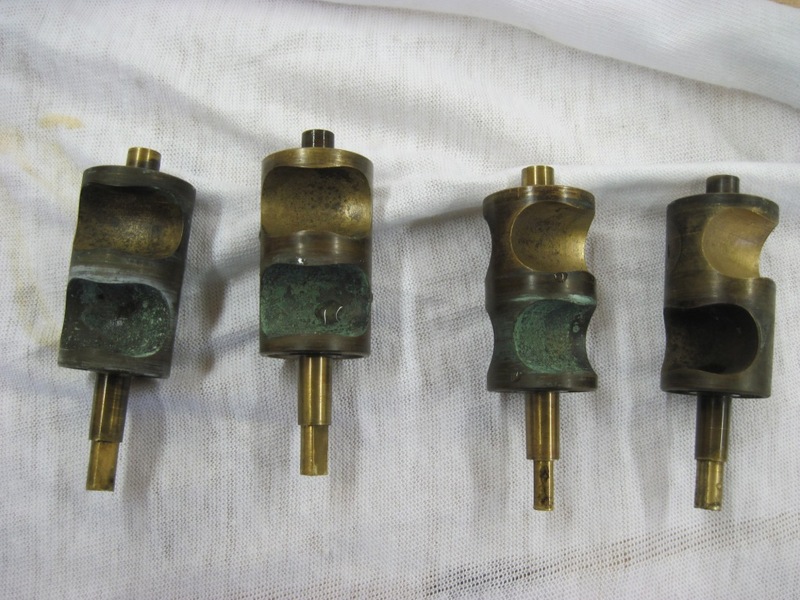 I found two major problems: First, the oil smelled particularly bad (my teacher commented on the smell as well as peers), second, when I went to clean out my horn, the valves had developed blue flakes all inside the valve ports. Blue Juice also seemed to evaporate kind of fast. It was time to move onto something else. Then one day the clouds parted and down from the heavens descended a bottle of Hetmans! Ok, maybe it didn’t happen exactly that way but it might as well have. Hetmans comes in three varieties for trumpets (not to mention the various other lubricants they sell for brass): Classic, Piston, and Light Piston. Developed by a New Jersey chemist, Hetmans is the best oil I’ve come across and it isn’t likely to be beat. I really can’t find any flaws with this brand other than it’s slightly more expensive than the others. However, it is well worth it. Hetmans lasts a long time after you apply it so you don’t need to use much of the stuff and it provides the fastest and most consistent action in every trumpet I’ve used it in. The three types are very useful as well: For your average trumpet with average tollerances, use the Piston variety. In high tolerance valves that are prone to sticking, use the Light Piston. 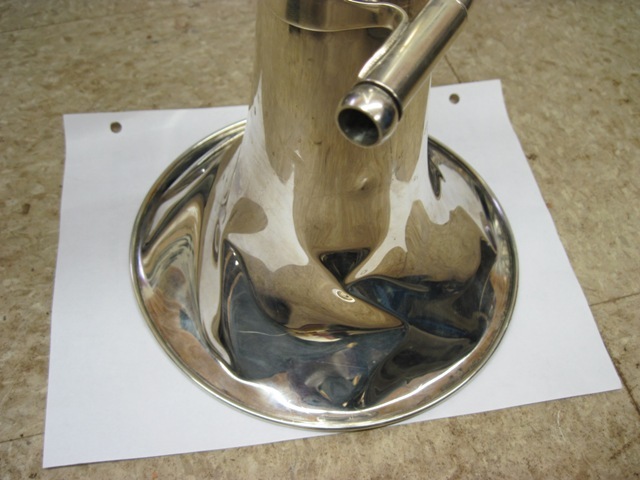 If you happen to have a vintage horn that may be getting close to needing it’s valves redone, then you can try the Classic Piston which does a good job taking up the wide valve clearance and smoothing out worn plating spots. So there you have it! You’ll have your own preferences when it comes to oils but these three brands are the standards. Personally, I stay away from the Blue Juice; there’s just too many negatives for my tastes. Actually, I prefer the Al Cass over Blue Juice. But I think, hands down, Hetmans is the top of the line. But there’s only one sure way to find your favorite oil…try them yourself! It’s important to clean your instruments. When you play, you’re blowing a good amount of saliva and hot air which condenses in the tubing of the horn. Saliva is acidic; if it wasn’t, it would take a lot more chewing before you could swallow your food. So when that saliva gets blown into a horn, if it isn’t cleaned out every so often, it will cause calcium deposits. Calcium deposits inside a horn appear as flaky, green, material that’s stuck to the surface of the metal. They’re actually little crystal formations growing on the brass. When they get built up enough, they will disrupt airflow inside the horn and in severe cases, they’ll make parts that move, like the rotor valves in a french horn, slow down and eventually seize completely. Another issue that can come up if you don’t clean your horn is the dreaded red-rot. Brass is an alloy, that means that it’s a metal made up of two other metals that were mixed together in certain proportions. The two metals in brass are copper and zinc. Over time, your saliva will carry away the zinc in the brass leaving the copper behind. This is why we call it red-rot: Because once the zinc is removed from the brass, we can see little spots where only the red colored copper is left. Without the zinc, the copper is pretty fragile. In time, the structure of the copper will break and little holes will develop that let air escape and make the horn harder to play. The only way to fix red-rot completely is to replace the rotted part. So how do you clean a brass instrument? Many shops will use a mixture of acids and rinses to clean out a dirty horn but the best method for your horn is ultrasonic cleaning. An ultrasonic machine uses sound waves, soap, and water to clean, not acids that can damage a horns finish. Transducers on the bottom of the ultrasonic tank create very high frequency sound waves that cause millions of tiny cavitation bubbles that vibrate the dirt off a surface. The beauty of ultrasonic cleaning is that it gets into every tiny space on the object being cleaned. Ultrasonic cleaning is also much safer for the environment because it doesn’t use any harsh chemicals that have to be disposed of later. 4. Use the snake brush to get into all the tubes and scrub them out as well as you can. Let the scrubbed tubes sit in the water after you’re done. 8. Attach the rag to the end of the flute rod and rap it around so you get a nice snug fit when you rag out the slides and valve casings. By doing the above, you will ensure that your horn stays clean and you will prevent calcium deposits and red-rot! 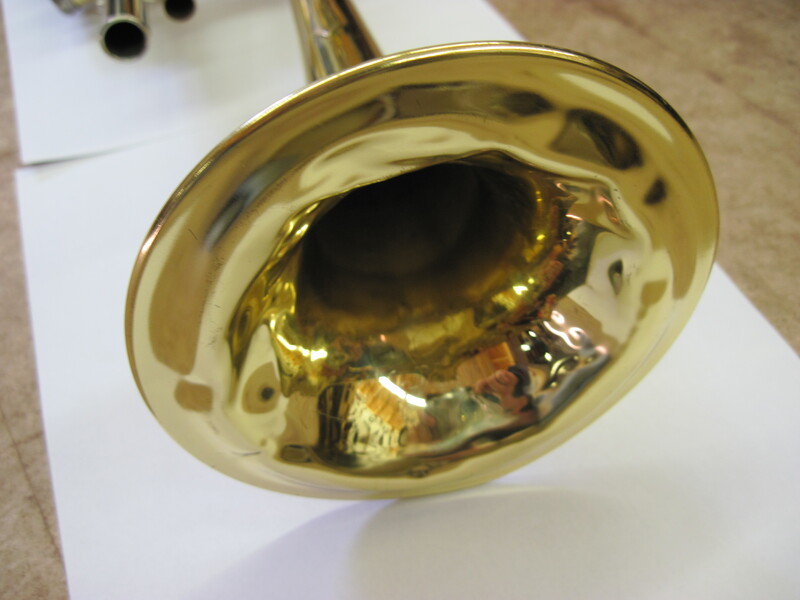 So your horn is busted…now what? First things first, if you’re not a repairman DON’T TRY TO FIX IT YOURSELF!!! I can’t stress that enough. I have seen a ton of instruments that would have been inexpensive, easy fixes, had it not been for some overzealous dad with a pair of pliers. There are specific tools and techniques to fix musical instruments and, believe me, dad (and your band teacher for that matter) doesn’t have this stuff in his toolbox. So what do you do? First you need to find a good repairman. Finding a qualified repair tech isn’t always easy but you need to go to a shop with techs that know what they’re doing; otherwise, you could end up paying to have things made worse. Re-seating and regulating means making all the keys and pads line up where they should and close when they should. Small leaks develop over time and the process of re-seating and regulating removes them. When a horn seals well, it plays much easier than when it leaks. Pad replacement is done when a pad can no longer be adjusted enough during a re-seat and regulate to compensate for leaks that have formed. The reasons a pad may no longer be able to be adjusted are it could have been torn, become too hard over time, been distorted badly, or has fallen out completely. It is normal for pads to go bad with time, how long they last is depends on a variety of factors that I will discuss later. Dent removal is exactly what it sounds like; dents are removed from the body of the instrument. Accidents happen and when an instrument made of brass falls or gets bumped hard enough, the metal will dent. Dents look bad cosmetically and effect the sound of an instrument depending on how severe. Cleaning is something that should be done routinely but is very often overlooked by musicians. 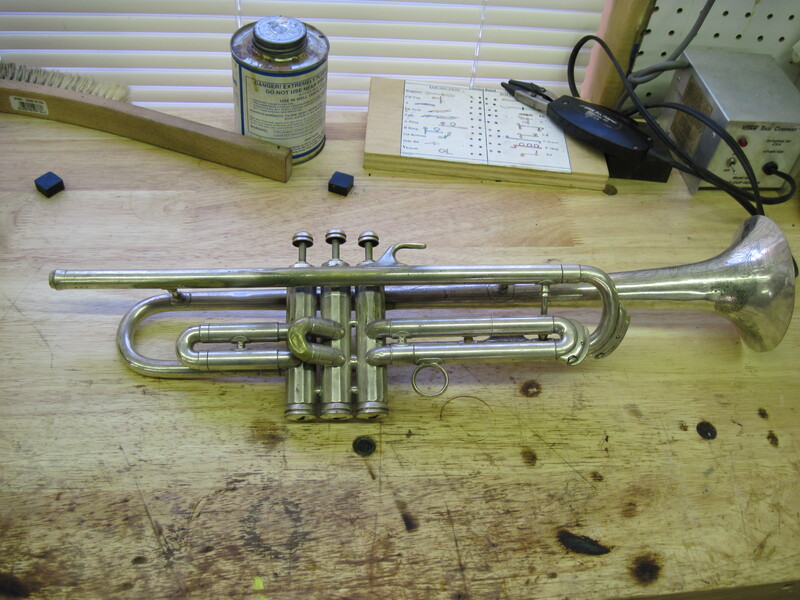 Having a clean instrument is most important with brass instruments. 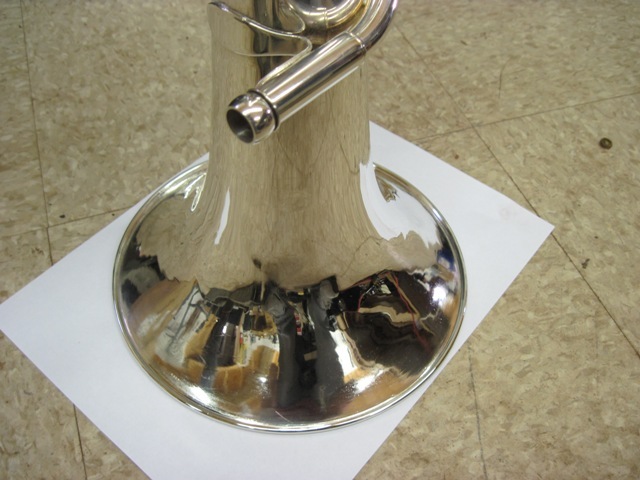 If a brasswind instrument isn’t cleaned from time to time, a condition known as red-rot can develop. Red-rot is when the zinc that is in the brass alloy gets eaten away by saliva and only copper is left behind leaving little spots that appear red. Eventually these spots will eat completely through the metal and cause air to leak from the horn. Once red rot starts, it can not be stopped so it is best to keep up with cleaning. It depends. There are a lot of factors that go into why a repair costs what it does and how long it takes. For a job like a cleaning, which should be relatively simply, the cost is usually proportionate to how big the instrument is: A trumpet might cost $100 to clean and service while a four valve rotary tuba could be as high as $280. Dent removal costs depend on how bad the dent is and where it’s located on the horn; sometimes a dent can be in a hard to access place and the instrument may have to be disassembled to do a proper job removing the dent. Re-seating and regulating a woodwind instrument also depends on the type and size of the instrument: generally, the bigger than instrument, the more it will cost to work on. You have to take into account the prices of materials as well. Overhauling a horn means different things to different people. Some people would define an overhaul to be the reconditioning of all mechanical systems, replacing all consumable parts such as pads and corks, and having all dents removed and the instrument refinished to make it look like new again. Other people might define an overhaul as replacing all the pads and regulating the horn without any cosmetic work. Sometimes it’s a mix of different operations. It can be confusing so it’s best to just ask the repair tech to tell you exactly what will be done. Whether it be the former or the later description, overhauls are expensive: For an overhaul to be done right, it requires a lot of time and materials, so keep that in mind when you are told the price. 1. Just because you bought a cheap instrument doesn’t mean repairs will be cheap. In fact, it is often the opposite: Cheap instruments are cheap for a reason; they are poorly made and will thus take more work to get them to play properly. If an instrument is of low quality, sometimes the cost of the repair will end up being more than the instrument costs. 2. Good repair shops are highly sought out and they usually are busy so don’t expect them to drop everything for you. Most shops will get things done in a timely manner but remember, you aren’t the only musician out there that needs their horn fixed yesterday. Expect a decent waiting time at highly skilled repair shops. Hopefully, this gives you some basic insight into the world of band instrument repair! My name is Dave and I’m a band instrument repair technician. I make my living fixing peoples musical instruments, specifically, band instruments. That means trumpets, saxophones, tubas, trombones, flutes, french horns, clarinets, etc. I also do a bit of orchestral string repair. In this blog I am going to be talking about my experiences repairing instruments with the hope that I can educate people. Whether you’re thinking of getting into the band repair trade, buying a new or used instrument, or just want to read about a not so common job, I hope that you will find this blog useful.